County Clare Situated in the mid-west region of Ireland, County Clare boasts truly breathtaking scenery and a wonderfully warm, charming and welcoming people. Clare is a magical county, full of surprise and contrast. Wild Honey Inn has countryside views from its bedrooms and the ground-floor bedrooms have garden access. The restaurant serves a bistro-style menu, and has a garden for al fresco dining. Wild Honey Inn has open log fires and a cosy atmosphere. 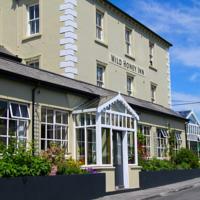 Wild Honey Inn is on the edge of Lisdoonvarna and is well-located for Doolin. Elegant rooms at Cullinan’s Seafood Restaurant & Guesthouse feature a plasma TV, tea and coffee making facilities and free Wi-Fi. En suite bathrooms include a power shower and hairdryer. A varied breakfast menu is offered, featuring pancakes, omelettes, eggs benedict and traditional Irish breakfasts. Cullinan’s Seafood Restaurant offers modern Irish cuisine with fresh, locally sourced produce. Prior reservation is recommended. There is a cosy TV lounge and various local pubs with traditional Irish music are a short stroll away. The Aran Islandâs ferry is 1 km away and the Cliffs of Moher are 8 km away by car. 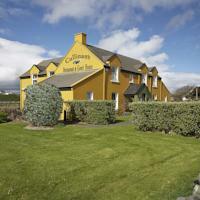 Cullinan’s has free parking and is 30 minutesâ drive from The Burren and 64 km from Shannon Airport. 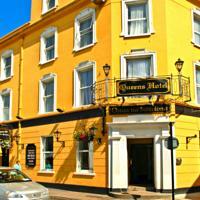 The Queens Hotel and Night Club is situated next to the ruins of the Franciscan friary in the heart of Ennis. 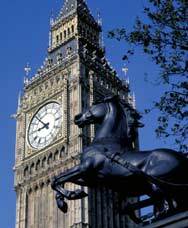 The charming shops, traditional pubs and good restaurants of the town are all within easy reach. With the hotel as a comfortable and relaxing base, you can explore the townâs narrow winding streets and the beautiful green countryside surrounding the town. Shannon International Airport is just 15 km away. The hotel is proud of its reputation as a warm and friendly gathering place. Admission into the on-site nightclub is available at an additional cost to all residents. Special discounted rates are available for those staying for 2 or 3 nights. 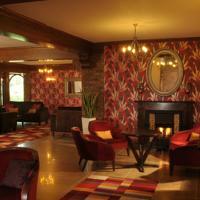 Rooms at Auburn Lodge Hotel & Leisure Centre in County ClareÂ each offer a TV and free tea and coffee. There is a private bathroom in each room, along with a hairdryer. Free WiFi is available throughout the entire hotel. The gym features state-of-the-art equipment with LCD screens, and guests can relax after a workout in the steam room and sauna. There is also a childrenâs pool, along with spacious changing areas. There are also four treatment rooms where guests can enjoy massages, facial treatments and pedicure. The Oyster Restaurant is open in the high season and serves both traditional and continental dishes prepared with fresh, local ingredients. The Ennis Restaurant provides informal dining in a wood and brick setting, while Taylor Quigleyâs Pub features seasonal live music, and an all-day snacks, carvery and bar food. Free parking is available, and the 13th-century Ennis Friary is located just 1.6 km away. Bunratty Castle and Folk Park is 10 km away, and the famous Burren & Cliffs of Moher are 30 km from the hotel. Xploreit Map of County Clare, Ireland (Xploreit County Series). This new edition shows the new motorway network in Clare and Limerick. A handy map of Ennis Town centre has been added as well as many new walking and cycle trails. This popular map has a comprehensive set of tourist destinations including the Burren, the Aran Islands and the Cliffs of Moher. Also detailed touring map provides a unique representation of County Clare – “The Banner County”. There is information on antiquities, leisure spots, touring routes for motorists, cycling routes and walking trails. It covers famous destinations such as the Burren and the Cliffs of Moher in County ClareÂ but also includes many lesser known spots that are equally interesting and enjoyable. A comprehensive selection of golf courses in County Clare, angling spots, beaches, historic sites, tourist centres and many other points of interest are clearly shown. The scale of the Clare map is 1:80,000. This County ClareÂ title is waterproof and Rip-Proof. It includes a detailed Index. Tourist Attractions highlighted, as well as walks, cycle routes and scenic drives. This title includes Ennis Town Centre map showing pedestrian areas and park. It covers local mountains, rivers and lakes. County Clare,(The Banner County), Ireland. In Ennis most trade guilds had their own banners: bakers, butchers, brogue makers, coopers, nailers, dyers, masons, harness makers, cartwrights, stone cutters etc. all competed to produce the most handsome of banners. At the inaugeration of the O’Connell monument in Ennis in 1865 thirteen different guilds carried banners, each representing the attributes of their particular trade. That this represented a long tradition in the town is not in doubt since, on that occasion, the brogue makers’ guild carried a flag that had first been unfurled in 1726. My own great grandfather, Brian Daly, was the custodian of the Ennis coopers’ banner and parts of the banner are still retained by the family. The coopers’ banner was not of the two pole variety that one usually sees today but was carried on a long single pole, topped by a small barrel; the banner itself hung down like a picture from a horizontal staff stretched across the top of the pole. I can recall as a child seeing the banner which was then much injured by time; it was a rusted red colour and carried the inscription ‘Hearts of Oak’. This banner along with many others were carried along the streets to greet the various dignitaries that visited the town in the late nineteenth and early twentieth centuries. Politicians like Parnell and de Valera were greeted by hosts of banners. It is easy to see then in the political excitement of the times how the county acquired the name ‘the banner county’. The reason the name stuck with Clare, I would suggest, was that custom of greeting politicians with banners, particularly at election time, survived longer in County Clare than in other counties. The Parnellite and de Valera eras coincided with the rise of the GAA and the name soon transferred to the county’s hurling and football teams. Take A Break Holidays takeabreakholidays,Â County ClareÂ San Francisco De Asis, Urb Marina, San Fulgencio, 03177, Alicante, Spain.